I was wondering if you could give me some advice? My two older Pointers had their pup jabs at eight and ten weeks. When I went for the booster the vet said because they were late they had to repeat the whole vaccine programme. They are four now and I haven’t given them anything else. The two younger ones are due a booster as are 17 months so are in fact overdue but I am loathe to do this as one has allergies and had a severe reaction to a mosquito bite! I know people advise the booster for early vaccinated pups. Also, we have a rat problem around here but I am scared to do the lepto jab as it killed a friend’s dog. I would be grateful for your input. There is absolutely no scientific reason for repeating a puppy series when older dogs have gone beyond the twelve-month booster timeframe. It’s utter madness and totally without any scientific justification. In order for protection to be achieved, a vaccine must be given when it can penetrate maternal antibody. However, the right time differs from one puppy to another. One study of puppies showed that the age at which they were able to respond to a parvo vaccine and develop protection (become immunised) covered a wide period of time. At six weeks of age, 25% of the puppies could be successfully immunised. At 9 weeks, 40% of the puppies were able to respond to the vaccine and were protected. The number increased to 60% by 16 weeks, and by 18 weeks, 95% of the puppies could be immunised. The above considerations do not apply to adult dogs. They don’t carry maternal immunity, so maternal immunity won’t prevent a vaccine from working. Therefore they only need one shot. There are many reasons why vaccination may fail. The immune response, being a biologic process, never confers absolute protection nor is equal in all individuals of a vaccinated population. Because the response is influenced by many factors, the range in a random population tends to follow a normal distribution: the response will be average in most animals, excellent in a few, and poor in a few. An effective vaccine may not protect those with a poor response; it is difficult to protect 100% of a random population by vaccination. The size of this unresponsive population varies among vaccines, and its significance depends on the nature of the disease. The most important cause of vaccination failure in young animals is the inability of a vaccine to immunize in the presence of maternal antibodies. Vaccines may also fail when the immune response is severely suppressed, e.g., in heavily parasitized or malnourished animals. (Such animals should not be vaccinated.) Stress, including pregnancy, extremes of cold and heat, and fatigue or malnourishment, may reduce a normal immune response, probably due to increased glucocorticoid production. Essentially, Merck is confirming that vaccines don’t work 100% of the time, for a variety of reasons. However, the World Small Animal Veterinary Association Vaccine Guidelines Group (WSAVA VGG) states that over 98% of puppies vaccinated after the age of 14-16 weeks are likely to enjoy immunity for years and probably for life. Don’t forget that even at nine weeks, 40% of puppies will have been successfully immunised. There are only two ways to guarantee if a vaccine has worked. The first is to subject your dog to the disease and see if he gets it (which you obviously wouldn’t want to do). The other way is to do a titer test (measure circulating antibody in the blood). If the dog has antibodies against parvo, distemper and/or hepatitis, then he is immune. The WSAVA VGG actively cautions against giving adult dogs a series of shots if their vaccines are ‘late’. 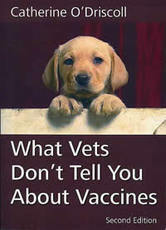 In fact, the VGG is doing the best it can to educate vets in vaccinology. In the meantime, Dr Ronald Schultz, a leading world expert in this field, says that vets aren’t actually qualified to advise on vaccination since their education hasn’t included vaccinology. Vets don’t appear, on the whole, to understand that if the dog is already immune, no vaccine is going to make him more immune. If he isn’t already immune from his puppy shots (due to maternal immunity blocking the vaccine), a booster at twelve months may give him immunity. But, really, only one booster is justified. Giving a series to an adult dog is of no benefit, and potentially harmful – since the more vaccines you give, the more you increase the chances of an adverse reaction. In other words, giving a series of shots when they aren’t necessary is potentially dangerous. The annual revaccination recommendation on the vaccine label is evidence the product provides immunity for (only) one year. Not true. That they are legally required to vaccinate annually and if they don’t they will not be covered by liability insurance if the animal develops a vaccine preventable disease – Not true. The only vaccine required at all by law [referring to America] is rabies and even that vaccine is not required in some states. There is also a concern that certain companies will not provide assistance if practitioners don’t vaccinate annually with core vaccines. Not true. In fact, all of the major companies have now demonstrated their core products provide at least 3 years of immunity and endorse the “not more often than 3 year” vaccination recommendation made in the AAFP Feline Guidelines and the AAHA Canine Guidelines. That not revaccinating will cause the animal to become susceptible soon (days or a few weeks) after the one year. – Not true for the core vaccines. They provide up to a lifetime of immunity or, at the very least, many years of immunity. If the animal is not revaccinated at or before one year the “whole vaccination program needs to be started again”. – Not true. If the immune response had been stimulated previously, memory cells will persist well beyond a year for the core vaccines. If they don’t continue to revaccinate annually, diseases like canine distemper, canine parvovirus, feline panleukopenia, and infectious canine hepatitis will “reappear and cause widespread disease similar to what was seen prior to the development of vaccines for these diseases.” – Not true with the core vaccines. It is not how often you revaccinate; it is dependent on how many animals in the population (herd immunity) receive at least one dose of the core vaccines at an age when maternal immunity cannot block active immunity (eg >16 weeks of age). That if the revaccination “doesn’t help, it won’t hurt.” – Not true. Vaccines can and do cause adverse reactions, thus don’t administer vaccines if and when they are not needed. Vaccines can cause severe adverse reactions, including death! That giving a vaccine annually that has a duration of immunity of 3 or more years provides much better immunity than if the product is given only once during the three or more years. – Not true. “It’s much cheaper to revaccinate the pet annually than it is to treat the disease the animal will develop because it didn’t get revaccinated annually.” This is the “better safe than sorry” philosophy: it is less expensive to prevent disease. This is why it is necessary to use the core vaccines. However, if the core vaccines are given as a puppy and again at 6 months to a year of age, then annual revaccination is not needed. Furthermore, if a vaccine is given that is not needed and it causes an adverse reaction, this is unacceptable and very expensive. They need to revaccinate all new dogs/cats coming to their clinic irrespective of vaccination history even when vaccination records are available from another clinic. Presumably the “other clinic” used the wrong vaccine or didn’t know how to vaccinate. – Not true. “Dogs and cats need to be revaccinated annually up to 5 to 7 years of age, then and only then would vaccination every three years be okay.” – Not true. Dogs and cats should be vaccinated as puppies and kittens with the core vaccines, making sure the last dose of vaccine is at 14 to 16 weeks of age. They should be revaccinated again at 6 months to 1 year of age, unless titers were performed; then they need not be revaccinated more often than every 3 years. Also, they do not need to have antibody titers performed more often than every 3 years and only then if you decide not to revaccinate. “Surgical procedures, including anaesthesia, are immunosuppressive thus dogs should be vaccinated prior to or shortly after surgery.” – Not true. Vaccines should not be given during anaesthesia and animals already vaccinated prior to surgery need not be vaccinated again. If they have never been vaccinated prior to surgery, wait until the animal has recovered from anaesthesia to vaccinate. “Because boarding kennels require annual vaccination, practitioners must continue vaccinating annually with all vaccines.” – Not true. Help change kennel rules through education and just use the vaccines that need to be given. The kennels need to understand that dogs and cats are up-to-date on their core vaccines when they have been vaccinated within the past 5 to 7 years and no kennel should require core vaccines more often than every 3 years. Please do note that we don’t need to vaccinate every three years. The phrase is ‘no more than’ every three years. With regard to Tammy’s dog with allergies, vaccination is contra-indicated (or at least it should be). The Merck Manual for humans cautions that patients with, or from families with, B and/or T cell immunodeficiencies should not receive live-virus vaccines due to the risk of severe or fatal infection. Elsewhere, it lists features of B and T cell immunodeficiencies as food allergies, inhalant allergies, eczema, dermatitis, neurological deterioration and heart disease. To translate, people with these conditions can die if they receive live-virus vaccines. Their immune systems are simply not competent enough to guarantee a healthy reaction to the viral assault from modified live-virus vaccines. Taking Merck (a vaccine manufacturer) at its word, a dog with allergies could even die if given another vaccine. He may not – but who would want to take the chance? The veterinary vaccine industry in the UK has tried to come up with figures to support their claim that lepto is ‘endemic’ (everywhere) in the UK, but they could only find 250 out of 8.5 million dogs who suffered from it. That risk-benefit figure hardly supports the use of this dangerous and ineffective vaccine.